Reviews our performance and big movers (stocks, bonds and preferreds) for the month. Discusses the difference between alpha and beta (especially as they relate to your individual long-term goals). Provides some advice on how to behave when the market gets volatile. Specifically, be opportunistic, but never lose sight of your long-term goals (we’ve been selective and opportunistic buyers, but we’re absolutely sticking to our long-term goals and strategy). The S&P 500 declined 6.9% in October, and many investors are getting nervous. However, to put the sell-off into perspective, here is a look at how small the decline has been, compared to historical S&P 500 gains and losses, going back to 2005. The bottom half of the above chart is the VIX (also known as the market "Fear Index"). Importantly, the Fear Index always increases as the market sells off. However, this is also usually the wrong time to panic, and sell everything (assuming you have a long enough time horizon). For example, as you can see in the above chart, each time fear spikes, that's usually a GOOD TIME to BUY because it generally marks a lower price point in the market before it resumes its long-term upward trend. The economy remains healthy (as measured by growing earnings, reasonable price-to-earnings multiples for stocks, and low unemployment, to name a few). And as you can see in the chart above, if you'd have panicked, and sold everything so you could hold cash, you'd have missed out on a lot of subsequent gains, historically speaking. We cannot over stress how important it is for you to know your own personal goals as an investor. If your goal is long-term capital appreciation, then you should probably have a good portion of your nest egg in attractive individual stocks (such as the ones in our Disciplined Growth portfolio, listed later in this report). But if your goal is low volatility income, with a shorter investment time horizon, then you should probably consider holding more lower-risk bonds, select preferreds, and/or more cash. Not to get too technical here, but the difference between alpha and beta is important. Beta is a measure of the sensitivity of your investments to the overall stock market. For example, the S&P 500 is generally considered to have a beta of one (1), and if your investments have a beta greater than one (such as aggressive growth stocks like FANG,) then your investments will likely go up more than the market when the market is going up, and go down more than the market when the market is going down. However, if your investments have a beta of less than one (1) then they'll likely go up and down less than the overall market (e.g. the S&P 500) when the S&P 500 goes up or down. Beta is systematic, non-diversifiable market risk exposure, whereas alpha is idiosyncratic stock-specific risk (i.e. how your stock is able to perform, irregardless of what the overall market is doing). On average, stocks have a beta of 1, so if you're going to invest in stocks, you can expect them, on average to move up and down (to some extent) with the overall market. Also, know your personal investment goals. How much beta can you handle in your personal investment portfolio? 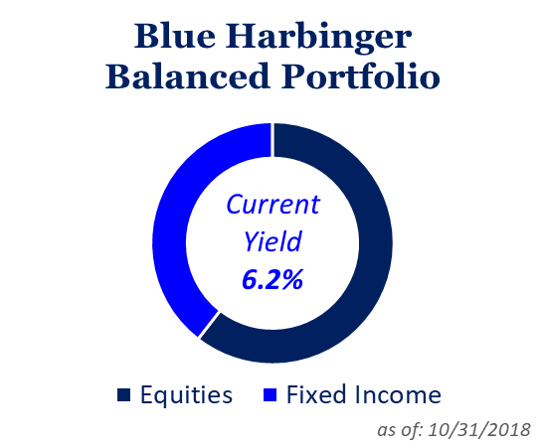 Our Blue Harbinger Disciplined Growth portfolio declined 6.9% during the month, roughly the same as the S&P 500, and continues its long-term track record of outperforming the S&P 500. This strategy is designed to achieve long-term capital appreciation. We expect volatility in the strategy (it'll be up and down from month to month because it has a significant amount of beta exposure--but we believe it'll continue to be up very significantly in the long-run--because of its alpha and beta opportunities). Our Income Equity strategy has a little lower beta exposure than our Disciplined Growth strategy, because it focuses on many higher income securities with somewhat lower volatility. However, it still has a significant amount beta exposure (which we like, because markets go up in the long-term... a trend we expect to continue--and we want to participate in). Here is a list (and brief commentary) on some of our current holdings that have recently been volatile and or provide particularly attractive opportunities. Netflix (NFLX): Netflix sold-off particular hard over the last month, and we believe it provides a particularly attractive long-term buying opportunity if you can handle a volatile yet powerful growth stock that pays zero dividend. Our thesis on Netflix is quite simply that it is a leader in a very large and expanding total addressable market. We recently purchased shares of Netflix in October, and we believe the price can easily more than double from here in the years ahead. Paylocity (PCTY): If you don't know, Paylocity is a cloud-based payroll and human resource processing company that is growing its sales very rapidly. The shares were down 18.1% in October (after being up very significantly in August and September). We've owned these share for several years now (they're up a lot in that time), and we believe the sell-off provides an attractive entry point for new investors. The company announced earnings on November 1st that were in-line with expectations, but sales were more than expected (and continue to grow rapidly). One of the most attractive qualities about this business is that the new business they keep attracting is "sticky" (i.e. once a company gets set up with Paylocity, they're unlikely to stop using it because it's such a pain to change payroll). This is a growth stock, not an income stock, and it sold-off hard like many growth stocks. We're long the shares, and look forward to more gains ahead. Shopify (SHOP): Is yet another attractive growth stock that sold-off hard. If you can handle the volatility (not everyone can) then it has huge upside in the years ahead. Shopify is a cloud-based platform that helps small and mid-sized companies run and grow their business. We recently wrote about SHOP in detail here. Square (SQ): Rounding our our attractive, yet volatile, growth stocks that have sold-off over the last month is Square. This is a merchant payment processing company for small businesses that has one of the biggest and most attractive total addressable markets as it continues to grow both organically and through acquisitions. We're long the shares, we've written about them in detail here, and we believe the sell-off has created an attractive buying opportunity for long-term capital growth investors. New Residential (NRZ), Yield: 11.61%, shares 0.3% in October. REITs can be very attractive for income-focused investors that cannot stomach higher volatility like we just saw over the last month. We like to mix REIT in with other investments in our portfolio because holding too many securities in one sector poses a dangerous concentration risk. For example, REITs are sensitive to interest rate risks, regulatory changes, and changing market preferences, to name a few. We own a variety of bonds and preferred stocks in our portfolio (as well as a wide variety more in client accounts too). Depending on your goals, fixed income securities can provide a lower risk source of income to meet your needs. For example, every single bond and preferred stock we own in our Blue Harbinger portfolios was down less than the S&P 500 in the month of October. The trade-off is that these fixed income securities often don't have as much upside price appreciation potential as stocks, but depending on your needs and situation--that may be just fine with you. Procter & Gamble (PG): Consumer staples company P&G is the first in our group of blue chip value stocks. Despite the market wide sell-off, PG actually posted strong gains in October as the shares were up 7.5%. P&G, like many dividend-paying value stocks, has fallen out of favor in recent years as the market gains have been dominated by aggressive growth stocks. However, P&G's business isn't going away (people need consumer staples like laundry detergent and toilet paper). P&G has significant exposure to non-US, and particularly emerging, markets. These non-US allocations have been under-performing the US, and from a contrarian value standpoint, they give P&G continuing powerful upside potential for the shares. We continue to own this attractive, dividend-paying, "Dog of the Dow." International Business Machines (IBM): IBM's business has struggled to grow in recent years, yet its powerful long-term legacy business gives it attractive revenue (and dividend paying power) for many years into the future. IBM's recent decision to purchase RedHat (RHT) drove the share price lower (the acquiring company's shares almost always go lower in these situations), but it finally gives IBM some attractive growth potential from here (in addition to its steady and powerful legacy business). General Electric (GE): No one's investment track record is perfect (they're either lying or inexperienced if they tell you it is), and we caught a little bit of a falling knife when we invested in GE months ago. We acquired the shares after we sold an income-generating put option, and the shares got put to us. We were anticipating a dividend cut when we sold the put options (that's why the premium income on the puts was so great), but we were not expecting the dividend to be cut twice, now siting at only $0.01 per quarter. It seems the selling pressure on these shares may finally be coming to an end as dividend investors have largely abandoned the shares, and it is finally positioning itself for some growth and share price upside. Despite the challenges in recent years (legacy financial crisis assets and sales, a 3rd CEO in the last 18 months, for example) GE remains a powerful revenue generator that can finally focus on growth without the distraction of dividend uncertainties. Royce Value Trust (RVT) is a high yield closed-end fund that invests in small cap stocks and is currently trading at a very attractive discount to its net asset value. Small cap stocks sold of very hard during the October sell-off (as small caps often due--they can be more volatile), but small caps as a style are powerful and can outperform other styles and asset classes. We wrote in detail about RVT here, and we believe the recent sell-off has created an unusually attractive buying opportunity. October was a rough month for the markets, but those types of months happen. If you can handle the volatility, the markets go up in the long-term, and if you select attractive stocks you can generate even larger gains than the market and much higher income, depending on your individual needs. Knowing your needs and goals is "the name of the game." And while volatility can create select attractive opportunities, it's critically important to know your goals, avoid costly mistakes, and stick to your long-term plan.